We go together - me expecting to hear nothing but he's right....a really strange banging/scratching noise is coming from inside the fireplace! Blast! must be a bird that's fallen down the chimney...but then I get this other mad idea that maybe it's a rat or something dodgy....the scratching really doesn't sound like a bird at all. 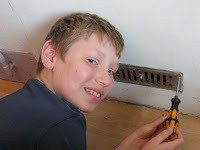 So together we move furniture and peek inside the vent with a torch to see.... a young starling that's fallen down inside. I ring Rab and he says he'll be about half an hour (he's the one that deals with things like stray birds in fireplaces - I don't 'do' things like that because I'm too scared of hurting them/damaging wings etc when I get them out). Two minutes after Rab gets home the bird pecks at the vent determined to try and escape and it comes flying off and the starling is then frantically flying around our bedroom like a crazed thing bumping into everything and pecking whatever he lands on in his blind panic. Rab's running from one side of the room to the other attempting to catch him, Djamel is shrieking and saying 'No daddy, this way - oops, no actually 'this' way now, over here, look over there, now he's gone this way' and Rab says 'Look, I'll catch him but you need to just shhhhh! for a minute' (in other words, just BE QUIET for one minute) LOL. Eventually after about 10 minutes, I say let's just open the window and see if he'll go out himself - so the daft bird then crashes into the closed window and stuns himself - Rab grabs him quickly....much to Djamel's delight. 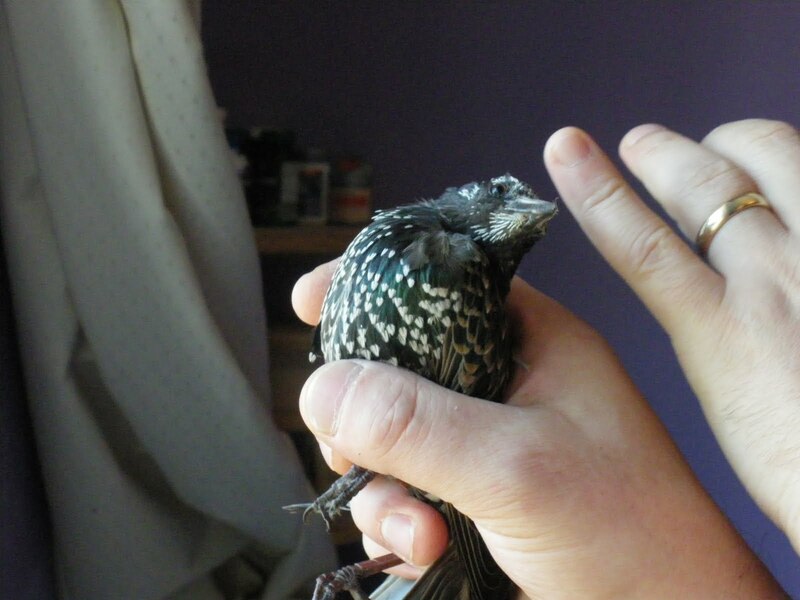 Rab calms the bird down, who then repays him by pecking him really hard on the finger - at this point Rab decides time for him to go and releases him out of the window to freedom. Great story Carole - and well done Dj! Its a nightmare when you're in a room with birds fluttering around the place. I remember staying in a place in France with my husband and there were bats in our room! They decided to make an appearance when we snuggled up in bed. They suddenly started swooping down at us. We were screaming with fear and giggling hysterically like girls! We made a hasty exit with the duvet over our heads. I quite like bats but have to admit I'd have been out the door like a shot if they were actually in the same room I had to sleep in. Probably didn't help watching those ridiculous Dracula films years ago - LOL. It's better to have a small actual advantage than the chance of a greater one. The bird whisperer strikes again ! !Thank goodness it wasnt in the night or Dj wouldnt have been so helpful with his covers over his head. Having a bat in your bedroom is NOT funny. Especially when there's a cat perched on the end of the bed helpfully trying to catch it, whilst you are cowering outside the bedroom door going "No, Phoebe. It's protected bloody species. You'll get me locked up!!!"